As I look ahead to working on inferring skills in the next two weeks, I want to find out more about what my students can do. Here is a simple inference assessment that gives me some useful information. The inference in this assessment is a very simple kind of text-based inference. Students need to use information from one part of the text to answer a question at the end of the text. While it seems easy to adults, I'm always surprised at how students approach the task! A question like this helps me to pinpoint which students are having trouble with putting aside their prior knowledge as they get new information, or see which students can make an inference but cannot find the specific details to support it. Each year, I've also found a few kids who do not know what a "hermit crab" is...this only highlights the importance of background knowledge for making inferences. For a period of time, my youngest son thought that "chicken" was a multiple meaning word. There was the chicken that was the animal, and the chicken in chicken nuggets. In his little toddler brain, these obviously were not the same things! At around 3, he inquired, "Why are they called chicken nuggets?" He thought for a moment, and then said, "Do the chickens help to make them?" I thought of this last week as I prepared to teach students about the word relationship. This is an important academic word, and kids have a lot of knowledge about it. But they don't always connect their knowledge in ways that make sense. For example, the most common idea that kids have about the word relationship is that it's a romance. (Giggle, giggle.) But this won't really help them to answer a reading question about the relationships between ideas, or the relationship between two numbers in math. Hopefully, my students now have a better idea of how the words relative, relate, and relationship are connected. Instead of seeing them as isolated words that happen to have similar sounds, they see them as a word family. And my youngest son? I worried about how to break the news to him that there only was one kind of chicken. But he figured it out for himself as we were eating rotisserie chicken one night. "Is this the animal chicken?" he asked. "Um...yes?" I replied, worried that he would be upset, or refuse to eat it. But I had underestimated his zeal. He pumped his fist, chortled, and crowed, "Yeah! I'm eatin' chickens!" The multiple meanings of chicken, united at last. How are students using context clues? Global Reading: Younger readers tend to read sentence by sentence, linking each idea only to the one right before it and right after it. In a cloze, readers sometimes have to take ideas from one paragraph and connect them to ideas from another paragraph. In the salamander text, for example, students needed to remember the idea "rainy March nights" from the first paragraph to fill in a blank in the second paragraph. By checking to see which readers were able to do this, I could learn a lot about my students. Students who filled in "days" instead of "nights" had not made this connection between paragraphs. They might not be taking a global view as they read. Going back: There are many readers for whom reading is a one-way activity. They go forward, and that's that. But skilled readers often will look back in the text, often to clear up a problem. Cloze activities are a perfect opportunity to model the benefits of looking back in a text. In the second paragraph of the salamander text, readers can use the given word "driving" to fill in the missing "roads" in a previous sentence. Some of my students were able to do this. Others did not. This gives me a good chance to model going back in a text to show that reading is not just a one-way street. Tricky words: In the last paragraph, students had great difficulty with this sentence: "In one town, people have ___built a tunnel!" Only one student had it correct (even) while about four put in words like "actually" that would fit in the sentence. But many others left it blank. This shows me that they probably need help with understanding and using adverbs. As fourth graders move into more academic text, adverbs are used more frequently. But can students understand them? If they can't come up with even or actually to fill in this sentence, a word like however is probably beyond them. Cleverness: Okay, so this isn't a technical term. But three of my students had the most adorable response. They put the word "cloze" in a blank. At first this troubled me. Where was this coming from? Then I thought about it from a reader's perspective. The top of the page reads "Salamander Crossing Cloze." These students didn't realize that cloze was the name of the activity. Instead, they thought it had meaning for the text, and were wringing every clue they could from the title. Clearly a "cloze" must have something to do with the salamander crossing! This is why I like looking at what students put in the blanks--each time, I can learn something new about my students and what they are thinking. The "Salamander Crossing" cloze is embedded below. Download it here to try with your students. This year, though, I've been adding a step. While we work in each text structure, we've also been looking at how to summarize that text structure. For example, when we looked at chronological order text, we talked about how a summary of needs to reflect the chronological order structure. For cause and effect, we looked at how successful summaries include both the causes and effects. But I can't think of anything worse than having students write a summary of every text, every day! To make the endeavor more interesting, I've been using a variety of scaffolds. Choosing the best summary: This is a simple activity, but so effective! After we read a text, students have to choose the best summary, usually out of a choice of 4. 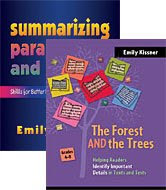 The less successful summaries generally reflect errors that I see in my students' writing--summaries with the "copy and delete" method, summaries that include personal opinions, and summaries that just mention the topics instead of the actual information. When students choose the best summary, they gain experience with the academic register of summarizing. I can also see what implicit rules they are using for summarizing and can correct any misconceptions. Luckily, kids find this a pretty interesting and engaging activity. Today they worked in groups of 3 to choose the best summary, cut it out, mount it to a piece of construction paper, and explain why it was the best summary. Summary Frames: A summary frame is a skeleton summary. You provide the students with the introduction sentence and the framework. Students fill in the details from the text. These are especially helpful for students who might be able to pick out the important ideas from the text, but struggle with writing. To help these students to synthesize the text details with the framework, have them read the summary aloud to a partner or rewrite it. Group Summaries: Try asking 2-3 students to work together to compose a summary and write it on a piece of large construction paper. As they get started, position yourself nearby. The conversation is fascinating! "How do we start?" one kid will ask, and then they'll take turns sharing the rules that they've generalized for how to start and then how to proceed. Sometimes, yes, they will squabble, but the disagreements are often productive in that one child will convince another to abandon an unworkable strategy. What to do with groups that seem stuck? I'll usually go over with a marker and help them with a sentence. Often this is enough to pull them ahead and solve their problem. What's been helpful is that students have had the chance to see how the different text structures are reflected in summaries. And we've had fun with different texts along the way! This week, I switched our focus from looking at chronological order text to looking at cause and effect text. Students often confuse these two text structures, and with good reason. After all, cause and effect text usually uses elements of chronological order. Causes come before effects! As I was thinking about how to introduce causes and effects, I remembered the frog Powerpoint that I made two summers ago. I made a quick little "cause/effect" table for students to fill out as we looked at the different pictures. Because we had just learned about physical adaptations, the frog slides helped students to see a content area connection. In addition, they learned that "result" is a synonym for "effect". After we looked at the frogs, students generated their own causes and effects. Some of them were definitely inventive! We used the "give one/get one" activity to share our causes and effects. Students walked around the room and shared their causes and effects with one another. Then, once we got back together, they nominated their favorite causes and effects to be shared on a group poster. How do readers understand context? If you really want to see what your students can do, try a simple cloze activity. Take 200 or so words from a text that you'll be reading together. Type that text, removing every 7th word. Then, ask students to read the text and fill in the missing words. What do they do? Watching the students and reading their responses is fascinating! Being able to complete a cloze passage is all about understanding the context of words. As I teach about context, I know that I want students to understand the word context. I also want students to be able to generate the words to fill in blanks, like on a cloze assessment. But state tests are coming up, and I know that students will need to use context clues to answer synonym questions on the test. That's a lot of instruction to remember! To help myself keep it all straight, I created this Powerpoint. Today we finished our Chronological Order centers. Hooray! Interestingly, the kids liked the historical text (The Great Chicago Fire, from Toolkit Texts), the animal life cycle texts, and the procedural text. The biography--well, not so much. I'm still thinking about why this genre is such a stretch for kids. Our last step was comparing two chronological order texts. Students worked with a partner to complete a chart with criteria such as topic, text structure, transition words used, and text features. Students could choose which texts they compared, and the classroom was filled with the quiet noise of engaged talk. "Why doesn't this one have any transition words?" one girl asked, pointing to the procedural text. "Good question," I replied. "Why do you think they're missing?" Working with her partner, the girl was able to recognize that a set of directions, organized in steps, doesn't need the same kind of linking words as a text written in paragraphs. Wow! I had two reasons for moving into this activity. Our fifth grade teachers have commented that students have trouble comparing texts across topics. By looking at two texts with the same structure, I could help them to see one important criteria for comparison. My other reason for having students compare two chronological order texts was as a kind of pre-assessment. By watching students work in pairs to complete the comparison chart and turn it into a paragraph, I could easily see what they knew about comparing and contrasting. Could they use any transition words? Could they craft a topic sentence? When I teach about compare and contrast text structure next week, we'll have a shared experience on which to build our learning. Hopefully, students will be able to remember the problems that they grappled with as they wrote compare and contrast text, and then examine how authors solve those problems. Sometimes I dive into the depths of ERIC to find new information and new ideas. I have a folder full of journal articles! Some I just look over briefly, others I read slowly, and still others help me to understand my classroom in a new way. My latest find is this article by Gary Woolley. Woolley looks at past research and explains a variety of strategies that can be used to help students who read with fluency, but don't seem to comprehend as well as they should. I'm so interested in this because it explores helping readers to build a mental model. A mental model is a reader's impression of the text, synthesizing what is in the text with the reader's prior knowledge. Successful readers build elaborate, complex mental models, pulling on many ideas. Less successful readers...well, we can't go inside their heads to see what their mental models look like, but we can guess that they are underdeveloped. Another way to help readers build a mental model is through the use of manipulatives. When students have concrete pictures or toys to move around, they can better imagine how characters and objects move through space. In this retelling nonfiction activity, for instance, students move around baby turtles to show how they hibernate in the winter. For example, today I helped students read a text about the Great Chicago Fire. (This was one of the groups in the chronological order centers.) It quickly became obvious that the students were not building a developed mental model. Oh dear! For tomorrow's groups, I'm going to give students a map of the city and some markers to help them track the progress of the fire through the text. By giving them a concrete visual, I hope to help them build a stronger mental model. Helping students to build mental models--and understanding how the process works--is the task of a lifetime. I'm fascinated by the chance to watch it happen!